Training – in case you didn’t know I ran the London Marathon in 3hrs 1 minute in April and since then I’ve eased off training (compunded by a light ankle niggle in the weeks just after the race). I’ve been a bit half-hearted about it actually but I plan to step it up with the aim of getting a personal best half-marathon time at the year’s Birmingham half-marathon. Colleagues in my running club are even getting me to think about my spring 2009 marathon (maybe London, maybe somewhere else) and how I should be training for it now – yikes! I’ve started running home from work a couple of times a week which is good for the soul, and on the pocket given the price of fuel. It’s only about 4 miles or more if I take the scenic route via Cannon Hill park (more again via the canals) but overall I doubt I’m running more than 25 miles a week at the moment, often less. 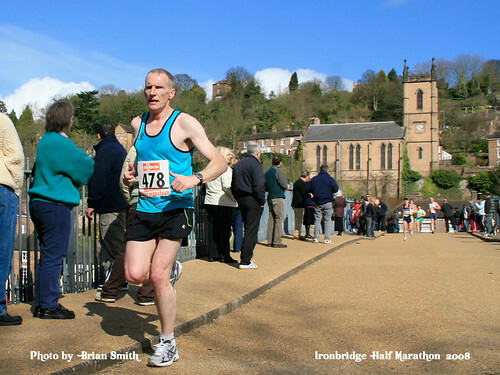 Racing – My last race was the Malvern half-marathon on June 22nd in which I came in the top 30 and recorded a good time in windy conditions of under 1hr 29mins. I was however a little dissapointed as it felt harder than any race I’d done for a while and I tailed off very badly in the second half. I should have paced myself for a more sensible run. I’ve much to do ahead of Birmingham in October if I’m to hit 1hr 26mins. In mid-August, for fun more than competition, I race against a train across fields in Wales. Beating the train there and back along the route is quite difficult apparently but it should be fun. I’d like to squeeze in a 10k race at some point over the summer or early Autumn but I should wait until I’m at least a little fitter. So overall this post is to let you know that I’m running less (I was doing 5-6 days a week during marathon training and up to 50 miles) but still enjoying it. In fact I’m probably enjoying it precisely because I’m running less. This entry was posted in running and tagged acorns, acorns triple run, Birmingham, Birmingham half marathon, Bournville harriers, canals, cannon hill park, race the train, running, wales. Bookmark the permalink. Dave I’m sure you’ll beat the train if you can manage a 3 hr marathon! There’s a great race 3 days before which a few from BvH normally attend – The Staffs Knot 5 – Wednesday 13th, Cannock Chase. Nice atmosphere and about 500 entrants usually.